The purpose of this study is to explore a new approach to planning/design in the Venice lagoon. It precedes and parallels the design of a large private site in this part of the city,1 where an increasing number of recent interventions have fallen short of the context’s inherent potential, particularly from the landscape perspective. Striving to go beyond these limits, this work aims at defining a new design methodology for this area, aspiring to enhance the many varied aspects of its landscape and, in more general terms, attempting to reconsider the way in which urbanism is viewed. This inquiry addresses the complex issues this site evokes through a broad analysis of pertinent cultural precedents that open the way to a multilayered or stratified methodology based on the classification of elements and events. These elements, and groups of elements and events, play a significant role in defining a footprint upon which an eventual design concept may take shape, enabling the final design concept to become an urban/landscape project. Getting to know the different - and, in some respects, new - reality of the area makes it possible to go beyond established notions of urban planning, therein providing the most thorough guidelines possible, permitting a more careful and more efficient approach to the city’s varied potential transformations. Talking about “architecture-landscape” as one expression comprised of two terms might reveal and give meaning to a new conception of urbanism (at different scales of design, for example), promoting another way of intervening on the territory through policies aimed at greater environmental sustainability. In the late twentieth century, there were in fact many examples of stimulating, innovative, theoretical and practical experiments in planning and design. On the one hand, there was interest in treating open spaces as urban “scenes,” attempting to create an architecture of the landscape that was considered not only as an autonomous discipline in the tradition of landscape architecture but also as a flexible contemporary design strategy that could be adapted to different circumstances, issues, and the propensities of the (geographical) territory and the (ecological and anthropological) environment. On the other, architecture was conceived as a metaphor for the landscape that could synthesize and express its visual and mental character through architectural “fragments,” transforming it through the evocative force of a poetic architectural language. 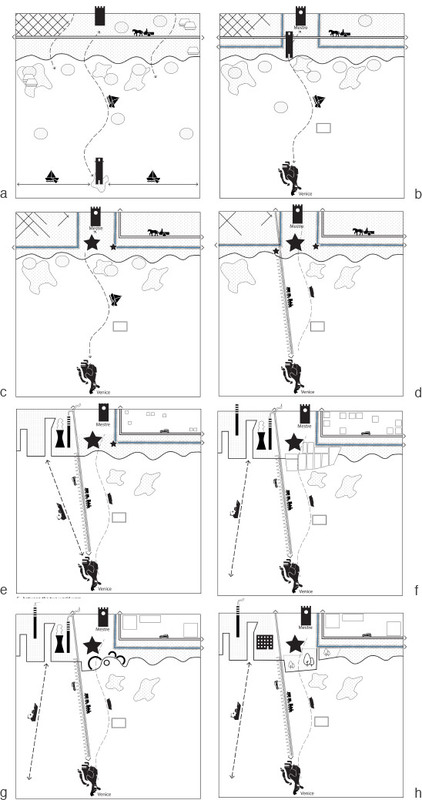 In both cases, however, it was not yet possible to formulate a clear methodological approach. Perhaps this might be possible by placing strong emphasis on the context and, more specifically, by contemplating the idea of intervening on the natural environment (therein accounting for ecological sustainability) without forgetting that the final aim of design is to create spaces in which people live. In the near future however - precisely because “everything in the twenty-first century is urban even in the midst of wild nature,” as Bernard Tschumi points out in his Downsview Park Toronto project - we will have to get used to unexpected urban solutions (Charles Waldheim). Perhaps now, in planning projects that are to be built today, the lack of clarity about what the “landscape” really is might actually reflect a similar theoretical “confusion” about the very origin of this “idea” of space. Starting from the etymology of the word “landscape,” one discovers that in German, Dutch and English the root of the terms Landschaft, landschap and “landscape” is defined by “land,” which means “portion of a territory.” Whereas in French and Spanish, the terms paysage and paisaje are like the Italian paesaggio, which is a “recent” neologism meaning “representation”; the original root of which is similar to the Italian paese or the place where one lives. This representation comes close therefore to the “cultural” vision that evolved in the history of art, in the work of Flemish and German painters at first and later in that of Italian and British artists. 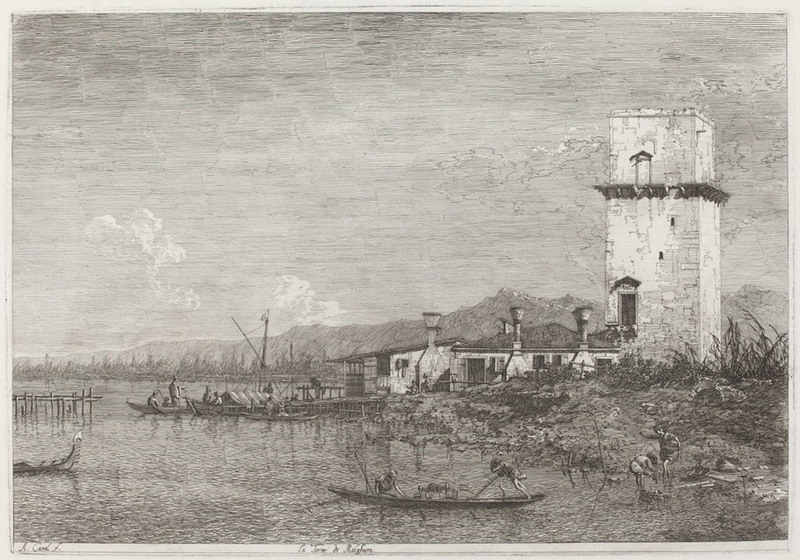 Antonio Canal, or Canaletto, Torre di Marghera, 1735–1746. Gianfrancesco Costa, View of Villa di Oriago, 1750. What must be addressed here therefore is the notion of a “modern landscape” project in Venice, to be built in the area between the Venetian lagoon and the Venetian mainland and thus in the lagoon. But given what has just been said, how can the fundamental role of this landscape be defined? Every time one works in an area as sensitive, and as full of history and constraints as the Venice lagoon, it is extremely difficult to make decisions because ultimately it is never fully clear exactly from which landscape one must start. It is not certainly an “uncontaminated” landscape. Quite the contrary. Given the history of these areas, the landscape has always originated, as Camporesi aptly states, from the territory‘s continuous transformations, which were crucial to the survival of Venice and its lagoon (Fig. 3). To broaden our point of view, it is interesting to note that many writers, working within the phenomenon known as “literary architecture,” gave rise to a new way of seeing the landscape, establishing artistic analogies with architecture more than the other arts.9 Reversing this logic, one might draw upon a methodological approach employed in literature to help define a new methodology for architecture and the landscape. Georges Perec’s Penser/Classer 10 is particularly significant in this light. Attempting to outline a methodology for design/planning based on a similar notion of classification, it becomes clear that the aim is that of identifying a new way of thinking about vast stretches of the landscape by trying to classify it and to recognize it for what it is, with its present, obviously past, and even future elements. These considerations, in turn, lead to the goal of “coining” a “new” conception of the landscape in which the traditions of a place and spatial innovation can coexist. 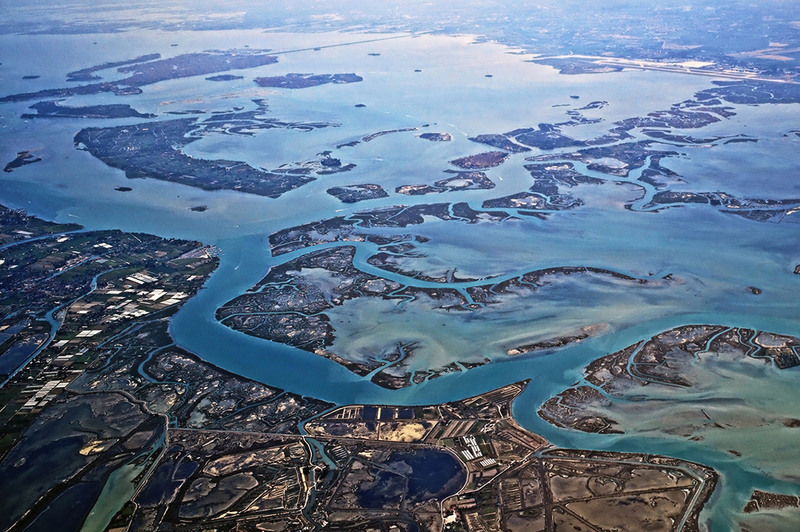 Aerial photograph of the Venice lagoon, 2012. Ludwig Hilberseimer, view of a commercial area, 1944. Thinking about vast stretches of the landscape leads to the term “panorama,” the etymology of which comes from the Greek pan meaning “all” and hórāma meaning “view,” and therein an unobstructed view of an extensive area or a comprehensive survey. This broadened vision provides the grounds upon which a procedure of “classification” can begin. From here, it becomes necessary to describe the events that have determined the landscape’s evolution, seen primarily through the way in which it has been developed.11 This is decisive to determining and listing the area’s key elements. Taken individually, these elements represent the landmarks, the “icons” with which the project can dialogue. When put into relationship with one another, they form significant groups that can be classified in landscape categories. All of this can then also be seen in the actual forms of the landscape’s possible transformation, in modifications that are predominantly horizontal (military fortifications, earthwork, roads, embankments, bridges) and unitary and vertical (casone, towers, chimneys), or in more general forms of urban transformation: from the countryside to vast industrial areas, from planned and/or inhabited areas to gardens and parks. Relying on a complete vision, which includes all of the territory’s elements without “aesthetic” distinction, allows new components for an urban/landscape project to emerge (Figs. 5, 8). These elements may be present, may have been present or were present. Or perhaps they were merely envisioned and designed and as such are not physically present but are nonetheless part of the urban evolution of a part of the city, as in Ludovico Quaroni’s project for San Giuliano. 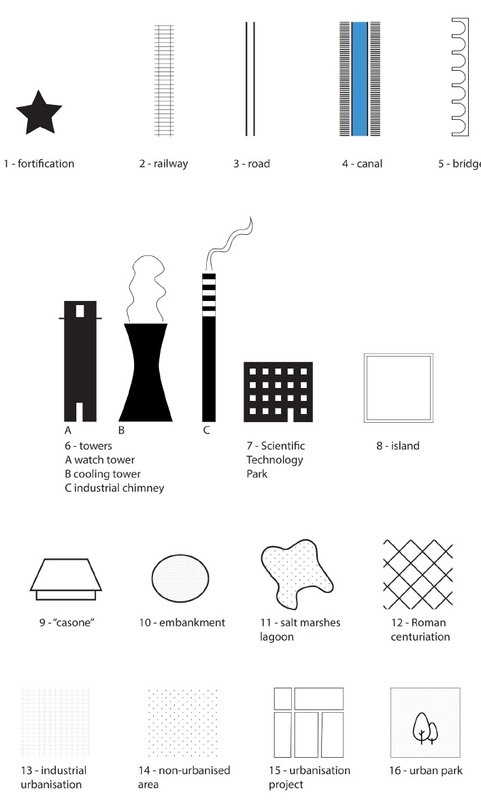 Classification of (and symbols for) the individual elements in the lagoon and surrounding area that will be aggregated into later schemas: elements of natural, military, industrial and urban origin have been included without reference to any specific time period. Ludovico Quaroni, project for the design competition “CEP Barene San Giuliano,” Venice, 1958. 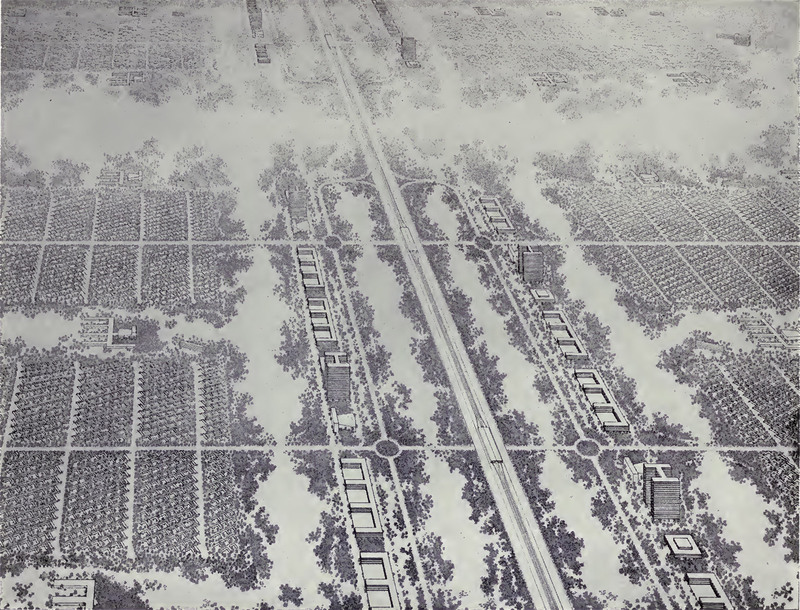 Antonio Di Mambro, bird’s eye view of the Park of San Giuliano from southeast, 1995. “Elements.” The individual elements have been organized into homogeneous groups. The aforementioned notion of panorama, of “seeing everything,” also introduces a “new landscape code” 16 - a different way of seeing and therein of combining a greater number of events and elements than those normally considered in transforming the landscape. This code makes it possible to go beyond the simple history of places, by identifying, selecting and, in some sense, discovering parts of the territory that have been planned or designed but never developed. From a practical point of view, this new landscape code and the values it imposes must guide the definition of a new design methodology. Yet in “thinking about (penser)” and then “classifying (classer)” these values, one must remember that this part of the territory (or the metropolitan city) has always been subject to reclamation (what is called colonization): from Roman roads to navigation canals to military defense works; from industrialization to the subsequent (and ongoing) ecological reclamation (see the events and elements illustrated here). Recent urban history must be taken into account as well, including all the important architectural competitions and (unbuilt) projects that are fundamental to understanding the urban role the area has always had and will continue to have in the near future. The footprint is a particularly effective starting point in this kind of research and must be investigated thoroughly until a convincing system for the landscape - and therein the urban project - can be conceived. It is also highly significant in terms of environmental conservation, the term itself “footprint” being key in the field of ecology. “Events.” Eight moments in which the area began to be seen differently: a) before the foundation of Venice, a primarily natural vision (sixth century); b) during the Serenissima Republic, the phases in which the lagoon began to be protected from the surrounding waters and military threats (seventh-eighteenth century); c) during the Napoleonic occupation, the consolidation of military defense systems (nineteenth century); d) during the Austrian occupation, the second consolidation of military defense (nineteenth century); e) between the two World Wars, the end of the military phase and beginning of the industrial phase (twentieth century); f) after WWII, urban and industrial reconstruction (twentieth century); g) from 1950 to 1960, a new urban vision (twentieth century); h) today, the start of depollution and an ecological vision (twenty-first century). What will be built on this site will take its start from this “footprint.” It will recover the most important stratifications of elements - the comprehensive knowledge of its nature, character and history and the significant projects that are part of the “disciplinary tradition” of architecture developed over the last century - with the goal of obtaining a blended reading of all the natural, urban and architectural phenomena capable of rendering the full potential of the “architecture-landscape” (Fig. 10). a) the first plans: 1. lagoon border - 2. Roman road - 3. Ponte di Pietra - 4. Canale delle Rotte; b) the military landscape: forts with shooting ranges - canals; c) the “Piano Rosso” [master plan of Mestre by Antonio Rosso, 1937-42]: road networks; d) the “Quaronian” landscape: building layouts; e) the urban landscape: existing buildings; f) reclaimed land: the (isolated) regulated areas; g) farmland: residual fields; h) the waterscape: canals and lagoon shoals; i) bicycle routes and pedestrian walkways; l) the green landscape: wooded areas, trees. The project for this urban area is now in a phase of preliminary planning. These notes prefigure and accompany a process that will eventually involve many different, highly specialized practitioners. In addition to satisfying the client’s needs, the project will have to respond to complex, extremely varied technical issues and bureaucratic procedures. What is proposed here is not a theoretical investigation. It is a truly methodological approach aimed at exposing the common ground on which the project’s different souls may be compared to reach one primary, fundamental conviction: namely, that what is planned and designed here will have to establish comprehensive development guidelines for this important part of the city of Venice, where an urban project cannot but have strong implications for the landscape (the “landscape project” is an “urban project”). • leaving a true “territorial footprint” in the lagoon of the metropolitan city of Venice. The sections of territory’s skyline attempt to provide a vantage point from which the conditions and opportunities for developing the landscape may be understood. The sections in the first part represent the current state of affairs and are basically a survey. Those that follow include examples of some of the urban events previously identified, to open to what might be developed upon what has previously been possible/desirable. When some of the aspects previously exemplified are introduced into the project, multiple solutions emerge. Combining a pragmatic approach (i.e. focusing on what has to be done) together with a comprehensive knowledge of the territory will make it possible to thoroughly examine and evaluate these hypotheses. The first step required mapping all of the fields in the remaining countryside. The historical and current road networks were then superimposed upon this. Finally, the visual axes of the Canale delle Rotte and the ideal view towards St. Mark’s bell tower were added. This is a project that focuses on the Venice lagoon, not just on the mainland and not just on Venice. The stratifications of these elements and the traces of these “lines” will make it possible to construct an actual footprint, an accurate territorial “mark” that can become a clear signature of a part of the territory. The project has been developing continuously with respect to these initial considerations. What must be established now are the pre-conditions to exploring a planning/design concept. What is important is taking measure and preliminary steps, establishing the relationships, heights, and conditions that the project will have to take into account. After that, the project will evolve - almost on its own - leading to even unexpected urban solutions (Figs. 11, 12). Skylines: top - view facing Mestre; bottom - view facing Venice. Sections: top - “Quaronian” urban section; middle - urban section of the park of San Giuliano; bottom - a hypothesis for projected heights. The site is located in a key point between Venice and the mainland of Mestre, near Ponte della Libertà, which connects the two centers, and adjacent to park of San Giuliano. A team, coordinated by the architect Christoph Kohl and myself, are analyzing the feasibility of a project for an important convention resort project here. Charles Waldheim, Landscape as Urbanism (Princeton, NJ, USA: Princeton University Press, 2016). Gianfrancesco Costa (1711-1773) was a Venetian set designer, architect, engraver, painter and one of the main proponents of urban representations of the villa. He left a particularly strong mark on the idea of villeggiare (being on vacation) in the villa, depicting it in the landscape as a real urban center, an enterprise of sorts where dozens of people lived and worked. Villa, therefore, was an abbreviation of villaggio, or village, which actually meant (and still does) paese. Piero Camporesi, Le belle contrade: nascita del paesaggio italiano (Milan: Garzanti, 1992). Camporesi (1926-1997) was one of the leading Italian scholars on the relationships between literature, folktales, food and landscape. Ludwig Hilberseimer, The New City (Chicago: Paul Theobald, 1944), 126. Ellen Eve Frank, Literary Architecture (Berkeley, CA, USA: University of California Press, 1983). Georges Perec (1936-1982) was a member of OuLiPo, a French group of writers and mathematicians. This book, which is his final work, is a collection of his newspaper articles, through which Perec ponders how to order his books: alphabetically, by color, based on their purchase date, etc. The question he poses regards the method of “classification,” which has many analogies with aspects of the elements of a territory, as defined in this study. In a future phase of study, it might also be possible to juxtapose an interpretation of natural factors to this, through a simplified scheme of the evolution of flora and fauna in the same time periods, highlighting the aggravated pollution that has grown out of the transformation of a naturally “original” situation and led to the loss of species (both flora and fauna) that are now very slowly repopulating the area. In 1958, a national design competition was held for a CEP [Centro di Edilizia Popolare, or low-cost housing complex - Ed.] residential district in the shoals of San Giuliano in Mestre-Venice. The leading Italian architects Giuseppe Samonà, Luigi Piccinato, Saverio Muratori, Carlo Aymonino and others took part. The winner was Saverio Muratori, but the project by Ludovico Quaroni (1911-1987) represented a significant turning point in Italian architectural and urban culture of the time. 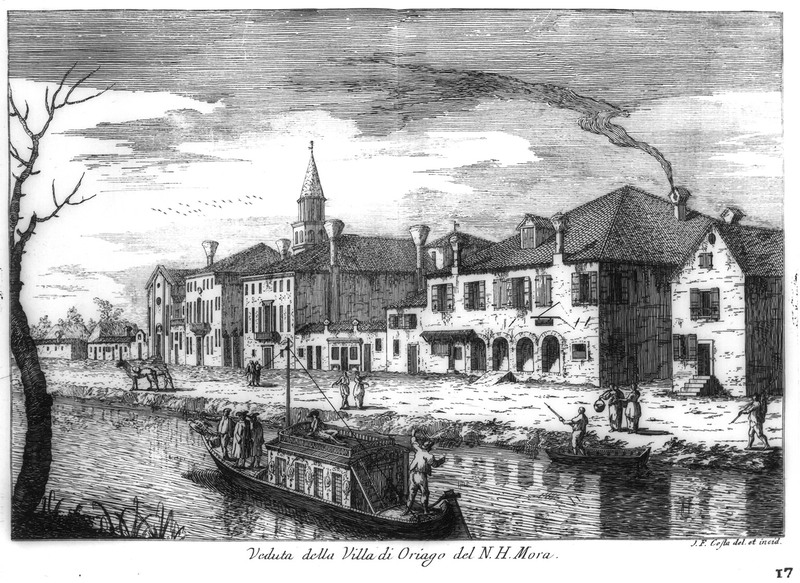 Mestre was no longer considered a peripheral district but took on an importance of its own as a settlement visually linked to Venice and its lagoon. Aldo Rossi, L’architettura della città (Padua, It. : Marsilio, 1966); English ed. The Architecture of the City, transl. Diane Ghirardo, Joan Ockman (Cambridge, MA, USA: MIT Press, 1982). This is an important text in the architectural debate on the city, which the author defines as an architectural artefact that evolves continuously over time and in which architecture, including works that were never built or implemented, is a driving element for urban dynamics. Rossi, in his introduction to the Portuguese edition (1977) of L’architettura della città, included in the 1978 edition by clup, Milan, 234–46 [the introduction to the Portuguese edition was written by Rossi in 1971 and previously published in Aldo Rossi, Scritti scelti sull’architettura e la città (Milan: clup, 1975), 443–53 - Ed.]. Antonio Di Mambro was the winner of the international competition held by the Venice City Council in 1990. He designed the master plan on which a large part of the park of San Giuliano was created. Figure 1: image retrieved from the National Gallery of Art, Washington, D.C. Figure 2: image retrieved from the Biblioteca Nazionale Marciana, Venice. Figure 3: image retrieved from Flickr.com. Figure 4: image retrieved from Ludwig Hilberseimer, The New City (Chicago: Paul Theobald, 1944). Figures 5, 8 - 12: images provided by the Author. Figure 6: image retrieved from the Ludovico Quaroni Archive, Rome. Figure 7: image retrieved from Il Parco di San Giuliano, exhibition catalog of the project by Comunitas Inc., team leader Antonio G. Di Mambro (Venice, It. : Comune di Venezia, 1995), 24-25.